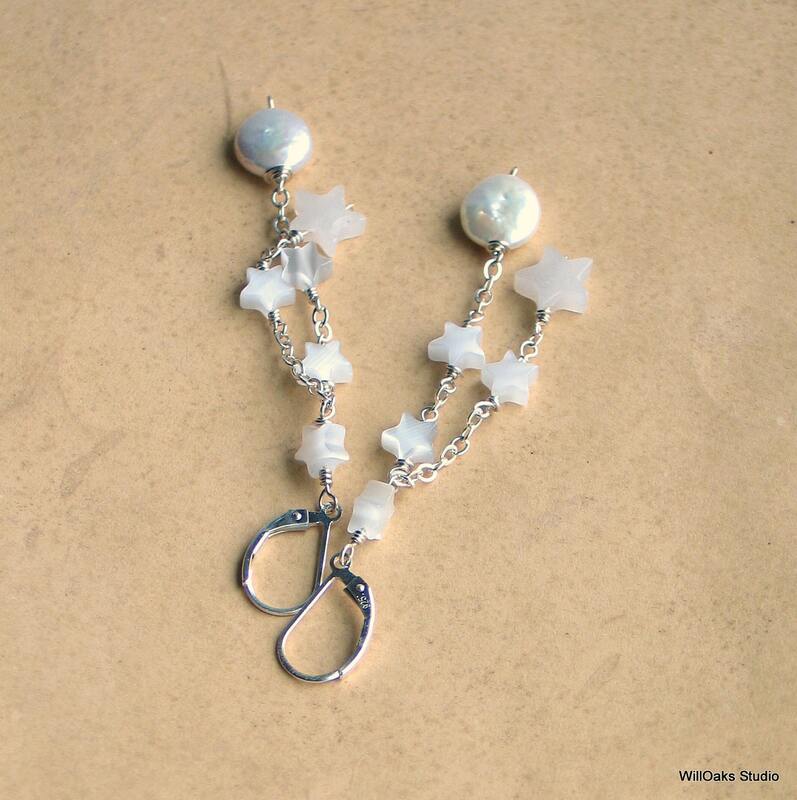 Celestial jewelry imagined as a starry night, with a moon and stars; original long dangle handmade earrings. 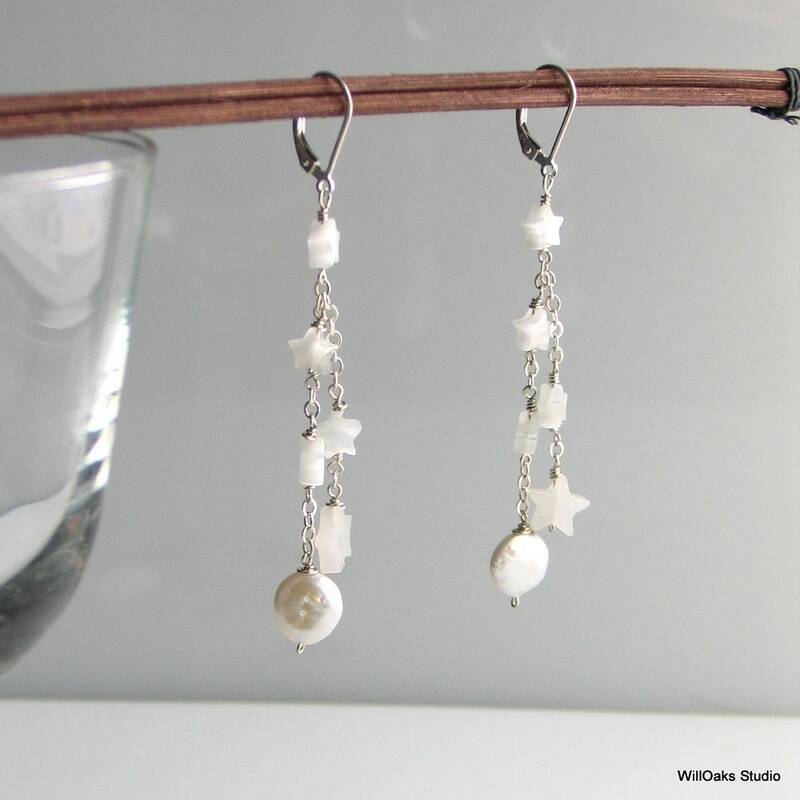 The celestial theme combines sterling silver, 10 mm coin pearls, a star cut from snowy quartz, and more smaller stars cut from shimmering, translucent white cat's eye glass. All are linked together with fine sterling chain and wire wrapping for earrings that will make you twinkle like the star that you are! Also, a delicate touch of "nature fashion" as elements from the night sky are borrowed to create this kinetic design. Sterling lever back ear wires keep the designs secure while fine sterling chain links together the moon and stars for earrings that swing and dangle freely. These measure 3 1/4" from the top of the ear wire. A limited edition original design from WillOaks Studio. Made to order & mailed in my signature box or velvet bag, ready to gift. 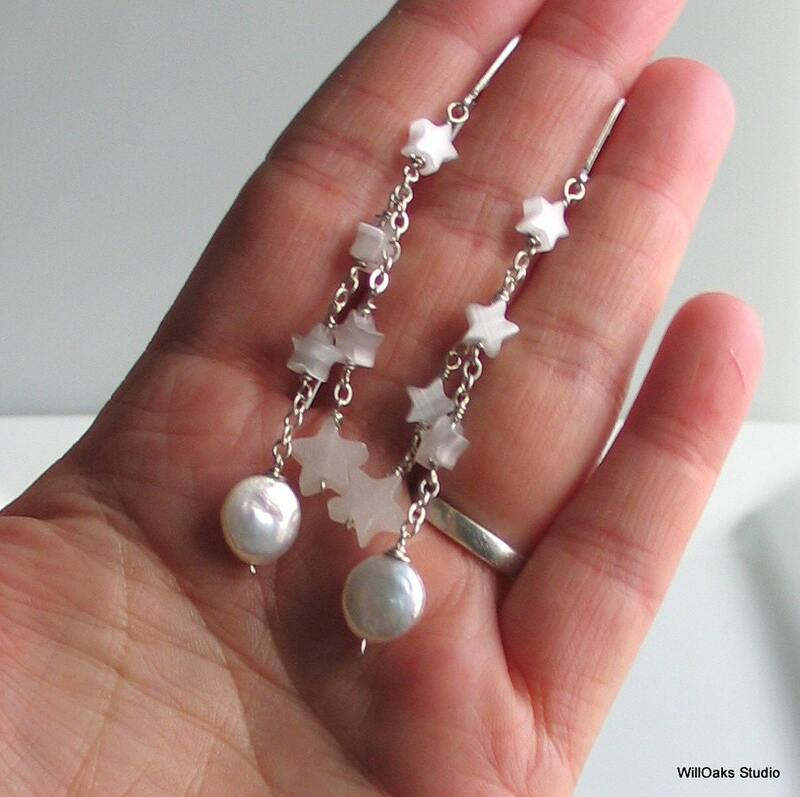 And what an original gift this would be for a star watcher or nature lover--or to honor the "star" in your life! 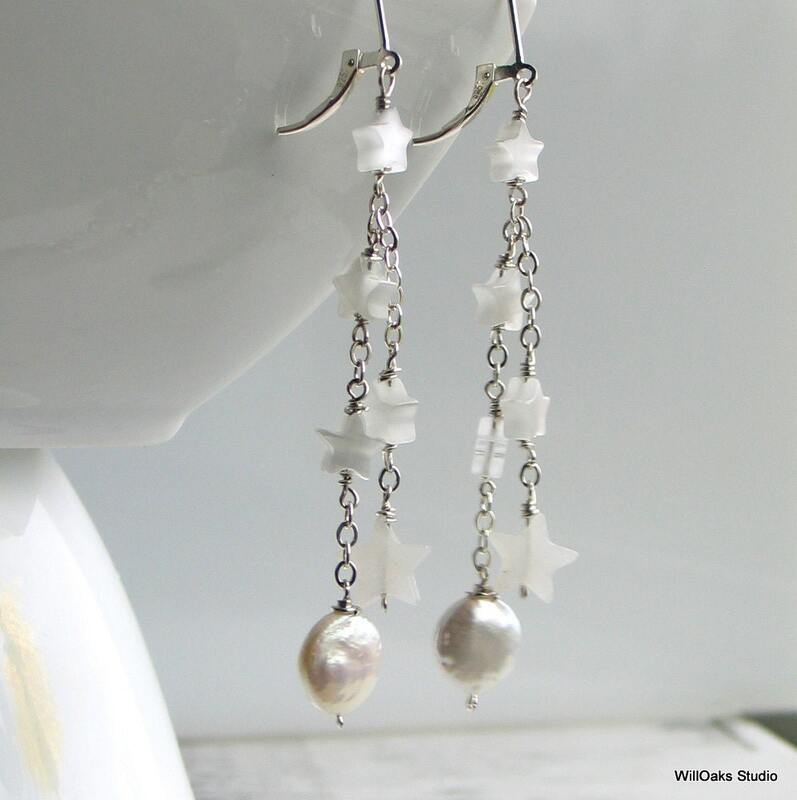 See more original earring designs and lots of other handmade, original designs via the front of my studio here https://www.etsy.com/shop/WillOaksStudio. 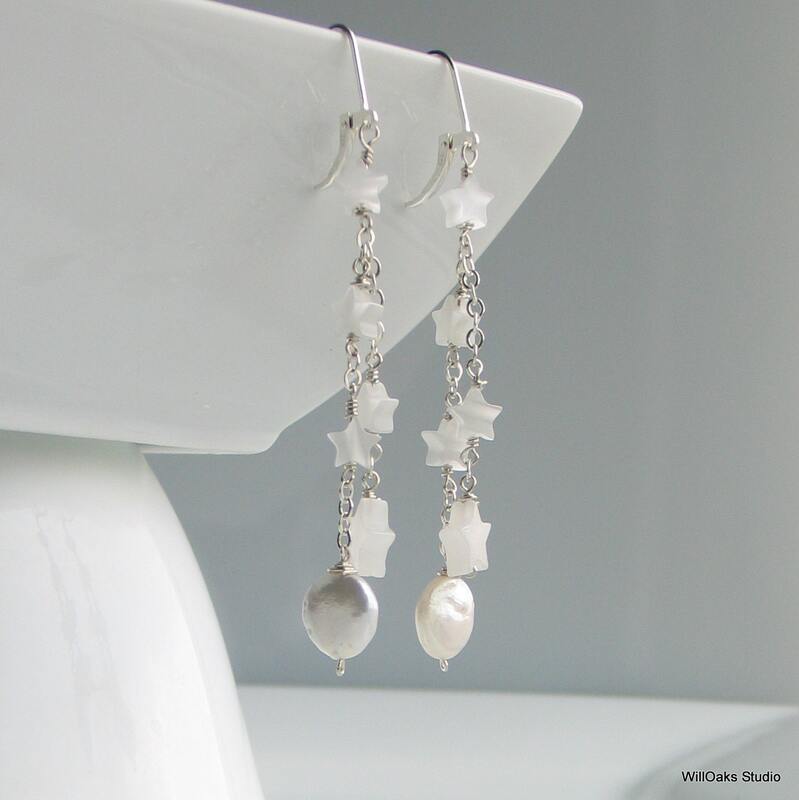 One customer's comments on my design: "Thank you SO much for this wonderful pair of earrings - they are very delicate, excellently made, and look amazing! Very sweet, and at the same time very festive. I should also add that even though these earrings are made to order, they reached me in no time! And the package.... outstandingly nice! And it contained even a small gift for me. I cannot appreciate your business more, Karen! Will definitely stay your customer." Please contact me with any questions or comments and thanks for stopping by! i just am in love with the pearls they dangle different lengths and the pearls are different shapes and sizes.quite nice to see the change. Thank you SO much for this wonderful pair of earrings - they are very delicate, excellently made, and look amazing! Very sweet, and at the same time very festive. nI should also add that even though these earrings are made to order, they reached me in no time! And the package.... outstandingly nice! And it contained even a small gift for me. I cannot appreciate your business more, Karen! Will definitely stay your customer.